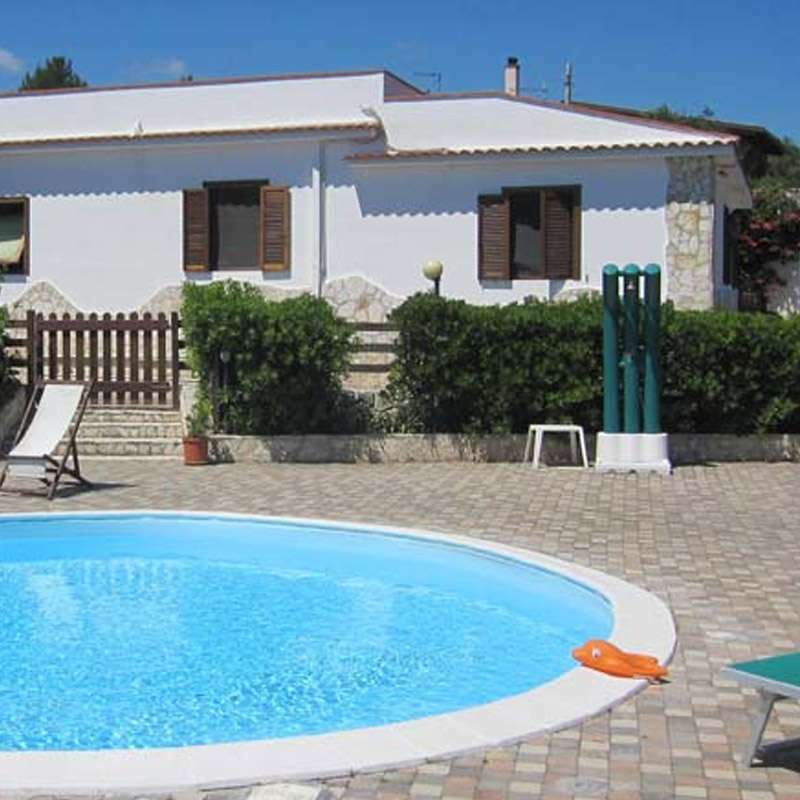 Just 300 meters from the sea ( Bay Molinella ), north of Vieste , from which is far only 2 km there is Villa Geco, a modern house with swimming pool perfectly placed in a fenced property of 1 hectar. Ideal for those seeking contact with nature and quite, Villa Geco is spread over 140 square meters. surface divided into large living room with sofa and sofa bed for 2 persons, satellite TV, kitchen equipped with a dishwasher, oven, microwave, laundry with washing machine, 4 large bedrooms, one with bunk bed, the other with 2 beds, 2 baths, one with shower, one with bathtub. Air conditioning in the lounge and two bedrooms. Solarium and large porch furnished with garden furniture, 2 brick barbeque; the first facing the porch, the second on the pool deck of 100 square meters. The pool of bean shape with depth measuring 6x12 min. 1.20 max 2,00 meter. Pool shower, deck chairs, and umbrellas. From the living room of the villa and the pool you can enjoy a breathtaking view of the bay and the old town of Vieste on the sea. The green area that surrounds the villa is on large terraces where rise native plants and olive groves. Ideal for two families, features of your equipment for small children including a small playground, and games for children. Tastefully decorated, is very bright and welcoming. It has 2 covered parking spaces . Are available on request : babysitting , daily cleaning service , bicycles. In ashort distance ( about 400m.) in the summer, in walking distance it is possible to find bars, market, restaurant, pizzeria, butchers, greengrocers . How to keep up to date with the latest news and offers? Join Our Newsletter and keep in touch with us!